The original Prince of Persia (PC) was a triumph in many ways. It was extremely well done, with excellent graphics (for the time), animation (again, for the time), brilliant level design, and awe inspiring puzzles. It was such a success, both critically and economically, that it was ported to multiple systems, including the NES and Game Boy. 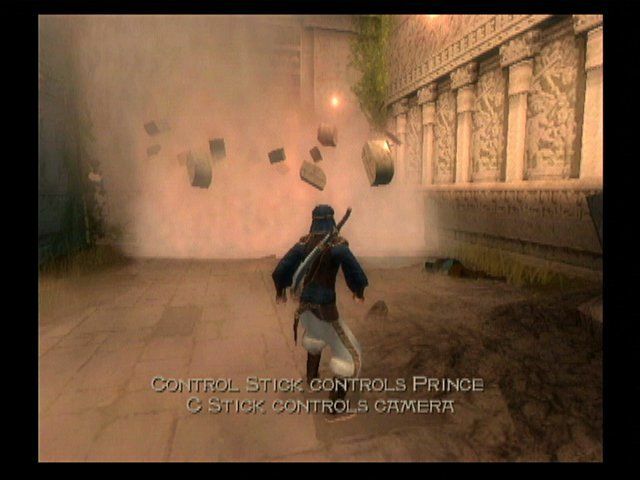 After several sequels, Prince of Persia finally came to the realm of 3D, without the supervision of creator Jordan Mechner, and was a game that received mixed reviews. It was a game produced by Mattel, a company that has since dabbled in very little of the video gaming world. However, with The Sands of Time, the creator of Prince of Persia, and UbiSoft, have created something wonderful, a jewel in a genre that is characterized all the best and worst of gaming?mostly the worst. It seems that every day some unknown developer will come along, thinking ?Hey! I?m gonna make the best action-adventure game yet!? and they fail horribly. This is not the case with The Sands of Time, rest assured. The graphics are gorgeous, the game play is awesome, and the puzzles are supremely difficult. Prince of Persia has not been a series that was known for its deep story lines. The Sands of Time, however, change that. The story begins with the Prince telling the player of how time is mysterious, how no one fully knows or has seen the currents of time. Save one. The Prince himself. He, being the only son of an elderly Persian king, goes with his father into his first battle, a siege of epic proportions at a Maharajah?s palace. The Prince decides to enter the palace to find any treasures that he fancies. Well, this leads him to a mysterious mythological artifact: the Dagger of Time. He also sees a large glowing hourglass, but that doesn?t matter. The Prince takes the Dagger to his father, who lets him keep it. And a woman is captured above this. When they reach a neighboring Sultan?s palace, the hourglass, now revealed as the Hourglass of Time, is unveiled as a gift. A brief history of the Hourglass is told, after which an evil Vizier, who was the Maharajah?s advisor, tricks the Prince into unlocking the Hourglass with his Dagger. Sand swirls around the throne room, engulfing everyone, save three?the Vizier, the Prince, and the woman who was captured. The Sand starts taking hold of everyone in the room, and turns them into horrific zombies that cannot die when it seems they are dead: except when the Dagger is plunged into their zombie-fied hide. So begins a tale which is epic in proportions, a tale of love, of hate, of war, and of armageddon. A tale of the Prince of Persia. Absotively poslutely beautiful. Managing to take an upgraded version of Splinter Cell?s engine, and then adding life like animation to awesome art and character design, the developers at UbiSoft have tapped into something special. Fabric ripples, dust and dirt collect on the Prince?s clothing, and heat warping effects occur when the camera shows an open flame. To add to this extremely life-like effect, the camera is used (for the most part, at least) to a great cinematic benefit. Most of the time, the game generates intelligent camera angles, which show awesome angles on what are generally usual actions (in the game, that is), from running along walls, to vaulting over enemies. It?s too bad that some issues bog down the camera. For one, when you fight on a balance beam, and you do that pretty frequently by the end of the game, the camera seems to try and find every single possible way that will block or hinder your view of the action. While this is often not a problem on the ground, it can become one?hence the need to block continually. The environments look exactly like you might imagine. Persia was located in the desert, so the visuals are appropriately sun drenched and lightly bleached. The castle is huge, and is styled exactly like pictures of Middle Eastern castles and fortresses show?except less ruined, and more collosally scaled, making the castle look as if it actually touches the heavens. In the same way, the castle is booby trapped, through and through. While you are an invader, and you did activate the defense system, the defenses are, well, still in effect for you. Yes, this means that, in addition to dodging bad guys and killing enemies, you must try and avoid difficult and ingeniously placed obstacles that only a man so nimble as the Prince can cross. In terms of combat, I believe that a game that centers around acrobactic sword fighting has never been more smoothly executed. The Prince can nimbly dash from enemy to enemy, first landing a kick on one, then slashing another, and backflipping to a third, before vaulting over a fourth, and with a couple of slashes, knocking the zombie to the ground. After that, you might hurry to the wall, where you can do a wall attack?quite useful in situations where your enemies corner you. Smooth flowing movements are certainly the highlight of Prince of Persia?s graphical effects. However, cutscenes are lovingly rendered, so much so that the characters look like they have been brought to life. And while the graphical polishes and touches may shock and awe, the real showstealer is the game play, which is going to be discussed in the next section of this review. Basically, The Sands of Time boils down to a very simple game play mechanic. You enter a room, kill all bad guys in said room, and then solve any and all puzzles in said room, of which there are sometimes three or four. But it?s actually more fun than it sounds. This is the bread and butter of Prince of Persia. There are multitudes of Sand Beasts, which are kind of like zombies, from Palace Guards, to Palace Dancers, to Chain Swingers (which swing chains, if you hadn?t figured that out.). Each of these have different weapons. For example, the Chain Swingers have chains (I wonder how I figured that out), the Palace Dancers have double knives, and the Palace Guards have pikes which are a big pain in the rear. Other enemies include Sledge Hammer Dudes (I made that name up. Aren?t I creative? ), which use sledge hammers, and Commanders, which are huge enemies that have gigantic swords that will literally kill you with one hit. Fighting is extremely simple and intuitive. All you use is one button to slash, and the Prince will perform all combos, save ones like vaulting or wall jumping, which require one other button. The catch is that once an enemy is down, they?re not out. You must stab them with the Dagger of Time, and recollect the sand that makes them into evil sand beasts. The problem is that the sand also took over the animals around the palace, so you have to contend with Sand Vultures, Sand Scarabs, and Sand Bats. Most of the time, you battle these violent dudes when you?re on a ledge or balance beam, as their main purpose is to topple you off of whatever precipiece you happen to be standing on. Really, special moves must be performed to actually solve many of the puzzles. These moves are almost always activated using the R Button on the Gamecube and Xbox, and something like R1 on the PS2 (I?m not really sure about that one.). Other moves include wall jumping, swinging on vertical poles, and jumping and sliding from horizontal poles. In the end, however, the game play boils down to what I said above, and if you can?t beat the puzzle, well then you need a strategy guide, my friend. The sound is, for the most part, very well done. The voice acting is superb, the music is an awesome mix of Middle Eastern, rock, and vocals, and the fighting noises are just plain good. Plus, little things like echoes, distant booms when ladders crash to the ground, and the steady dripping of water all add to a unique experience that is ambient along with believeable. Again, however, there is a small problem with the sound in the game. Every so often in certain areas, the vocal sound effects?well, they sound just plain tinny. In other words, it sounds like the actors are shouting through metal tubes that alter their voices significantly. This happens with the monsters as well, and the music isn?t left out (how could it be? Perish the thought!) at all. Man oh man oh man oh man?what awesome, intuitive controls, such that the world has never seen before. The A button (this is on Gamecube and Xbox) does things like jumping, rolling, and vaulting, while the B button cancels out of things, and does various sword attacks. The X button puts weapons away, while the Y button harvests the Sands and controls the Dagger?s attacks (which include the normal Freeze attack). The L button controls time itself, from Rewinding time to helping with the Mega-Freeze attack (which is performed by pressing R and then L). The R button is like the Action/Special Move button, controlling blocks, running on walls, pulling levers, and activating switches. That?s it, to tell you the truth. And it?s so easy to control, but so hard to play, and really hard to master. Really master. This is a game without any mention of religion, whatsoever. It is a game that tells of a magic Dagger and a magic Hourglass that store the very essence of Time itself. Anyone who controls the Dagger can control time; in other words, it is the ultimate tool of the Second Chance, the thing that all who have messed up want?one problem. It?s a game. Because religion is not mentioned, this game is a mixed bag. On the one hand, it cannot offend Christians because of its mention of pagan gods; on the other, it cannot reach out to nonbelievers because Christians did not make it. There is a small amount of bloodshed in The Sands of Time, and this is mostly shed from the main character. There is one instance where the Princess bleeds, but it is not a very big thing. Another thing is that the evil Vizier coughs up blood?kinda nasty, but not offensive. Violence is a big part of The Sands of Time. The Sands transform all of the citizens and visitors to the palace into evil, Sand Beasts (which, although described by some as demons, are far from it. They are more akin to zombies than anything. In all truth, the Sands are much like the T-Virus from Resident Evil, infecting people and turning them into zombies.). Another problem with The Sands of Time is the sexual content. Some of the enemies, the Palace Dancers to be exact, are very scantily clad, wearing loin cloths to clothe their privates. The Princess is also very scantily clad, and she and the Prince?well, they take a bath together. Yes, it?s corny. Yes, it?s kinda stupid right there. But they don?t show anything, and it sets up the end of the game. Still, the developers should have left the offensive, sexual stuff out of the game, as it has virtually no worth in the plot at all?except what I mentioned above. Besides a ?Making Of?? featurette, Prince of Persia: The Sands of Time on the Gamecube and PS2 features the entire Prince of Persia 1 game (this is old-school people?like NES days). Xbox owners, don?t feel left out! You get the better deal! Xbox owners (who are really completists) get both Prince of Persia 1 and 2. Now, how?s that for a bargain?